Screws included on revolver grips only, not on automatic grips. 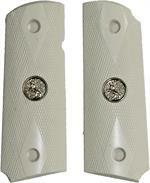 Colt 1911 Officers Model Ivory-Like Grips, Checkered With Medallions. Grips Also Fit Colt Defender, Kimber Ultra Carry & Clones. Ruger Vaquero XR3-Red Ivory-Like Grips With Medallions, Slim. Grips Also Fit Ruger Blackhawk, New Model Single Six Revolvers & Ruger Super Blackhawk with the Round Trigger Guard Only. Ruger Vaquero XR3-Red Ivory-Like Grips, Checkered With Medallions. Grips Also Fit Ruger Blackhawk, New Model Single Six Revolvers & Ruger Super Blackhawk with the Round Trigger Guard Only. 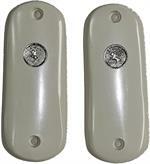 Ruger Single Six Revolver & Ruger Old Model XR3 Ivory-Like Grips With Medallions. Grips Also Fit Ruger .357 & .44 Flat Top Blackhawks. 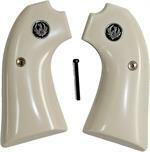 H & R New Model Revolver Ivory-Like Grips, 4" & 6" Barrels Only. Magna Style, Smooth With H&R in Circle, Includes 2 Screws.